Until the late 20th century, the Isle of Wight's geographical position, combined with the weapons technology of each previous age, meant that the Island always possessed a strategic importance for both invaders and defenders. In effect, the Isle of Wight has always been a 'frontier' zone - a potential battleground; an entry point to England, open to invaders; or a base from which to attack the mainland. Consequently from an early time, the local inhabitants, and in times of a more centralised, national infrastructure, the government has felt it necessary to defend the Island from a perceived threat by establishing three forms of defence: a local militia force, an early warning system and fortifications. Clickable Map : move pointer over red square and click to be taken to information on that particular fortification. Most of these small forts were located near creeks or estuaries, or easy landing areas. They were sited to provide a field of covering fire to prevent or hinder a landing of enemy troops or to prevent access by enemy ships to the Island's creeks or havens. All were small in size containing only one or sometimes several guns. At least three were constructed mainly from timber and earth, while two were most probably made of local stone. 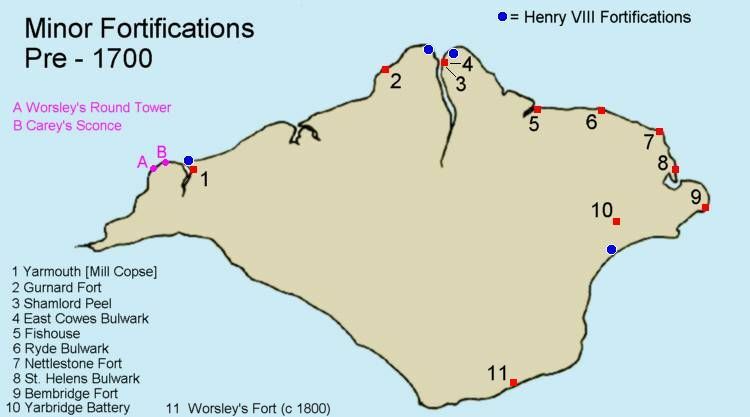 There are useful records available for the construction of Carey's Sconce, which provide useful pointers to the structure of several of the smaller forts. However for most of these minor forts, there is only a few references in documents or maps. Only Ryde fort is with significant mentions in the records of the Manor of Ashey and Ryde. To defend the important anchorage of Yarmouth roads and harbour, Henry VIII had built Yarmouth Castle in1539-40. In the 17th century, further small fortifications were built to defend the landward side of Yarmouth. Sir John Oglander and a guide to Britain [Britannia, or, A geographical description of the kingdoms of England, Scotland, and Ireland ... by Richard Blome. London, 1673] both suggest that there were several small defences constructed. 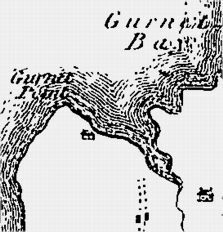 Before 1600, the land on the west side of Gurnard marsh extended alot further out to sea than it does today, providing a small but usable harbour. 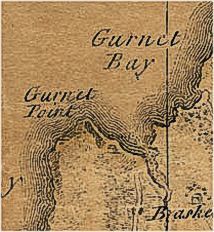 Dr. Wilkins, a noted geologist, recalled that "In my own recollection acres of land have been carried away at Gurnard and the Solent has been much widened. Indeed, when I was a boy, a man occupied a cottage and a garden (long since washed away) which I visited. That old man told of a time when in his youth he had played on fields then existing on the site of the present white buoy (two-fifths of a mile offshore) which now warns vessels from the Gurnard Ledges". "As I am penning this to her [mother] dear memory I gaze across to Gurnard Ledge buoy, where the Solent waters are being churned into a raging sea by the north west wind that is reaching towards a gale. The remains of the cottage where she was born (April 30th, 1829) are under that raging sea, about one-eigth of a mile from the shore, and at low water spring tides anyone can walk about on the stone flag kitchen floor. The fields where she played as a girl are all gone with the encroachment of the sea." Top left: John Andrews, 1769. Top centre: Thomas Milne, 1791. 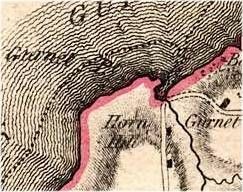 Top right: Burns, 1794. Bottom left: Isaac Taylor, 1759. Bottom centre: John Albin, 1795. Bottom right: Ordnance Survey, 1793. "As this precious Island is well strengthned and fortify'd inwardly, so is she also well guarded, & defended outwardly, by Yarmouth Castle, Cowes Castle, by the Needles & Sandom ffort, having no place of Invasion, either In, or Outletts, but such places as are safely defended. At Yarmouth agt [against] Hurst Castle; Garnord agt Leep; Cowes agt Calshoke Castle; and Ride agt Portsmouth so as no daring approching Enemies can passe those Channells wthout thundring Gun-shot from those commaunding Castles." The fort disappears from records at the end of the seventeenth; presumably it was allowed to decay, there being no longer any need for it. 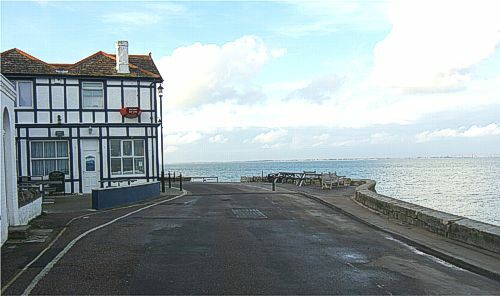 Cowes had developed rapidly in the 17th century from nothing to being the main commercial and transit port for the Island. Gurnard also suffered increasingly from erosion on the seaward side and silting of the creek or 'luck' on the landward side. The low headland that existed on the west side of Gurnard marsh was steadily eroded in the 18th century probably due to the continual encroachments of quarrying that denuded the natural protection provided by the Bembridge Limestone ledges in the vicinity. "In 1868, permission was obtained to continue the excavation, when it was found that the building had been cut through at right angles directly through the hypocaust, and the materials thrown up to form a rampart for the Gurnet Fort, which was probably a work of Henry 8th and which was in a state of deficiency in1635, and probably to the end of the seventeenth century. It was evidently nothing but an earthen Rampart with two or three small guns on stone platforms. ... From the refuse heap, the ground had been disturbed, to form the rampart and ditch of Gurnard Fort. 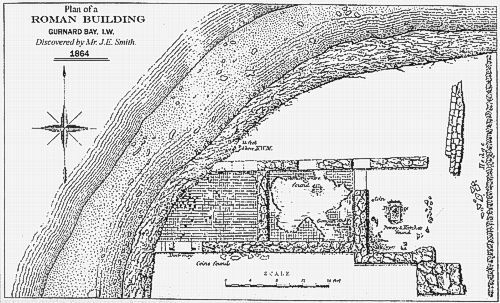 The building was set out about two feet from the commencement of the Kitchen and continued in a straight line from thence to its termination about 40 feet to the East.."
Smith identifies the garden of Marsh Cottage as it was then as the site of Gurnard Fort. Much of the villa site was rapidly eroding before their very eyes at that time, further emphasizing the rapid denudation of this area. Today the site of the villa has totally vanished, while over half the garden area has also disappeared. In the 14th century, it is recorded in the Calendar of the Fine Rolls that a number of oaks from the King's Forest [Parkhurst] were ordered to be used in the construction of some peels at Shamelhorde, the old name for Cowes. Commission to John de Weston, John Wyndesore and William de Keleswych, reciting that the oaks lately growing in the King's forest in the Isle of Wight have been thrown down in great numbers by a violent storm of wind, and that for the defence of that isle against the attacks of aliens, the King has ordained that in the port of Shamelhorde in that isle one or two peels, as need require, shall be built with part of the said oaks, and the residue thereof sold to the King's advantage; and appointing the said commissioners to survey the said oaks so thrown down and cause as many as will be necessary for the building of the said peel or peels to be brought to the said port, and the peel or peels to be built there, and to sell the residue of the oaks and receive the money arising from the sale thereof and apply it to the costs of building the peel or peels and to keep the residue of the money, so that they answer at the Exchequer therefor; the King having ordered John de Countevyll, keeper of the said forest, to be intendant. By the guardian and council. A peel or pele is generally thought of as a defensive tower in and around the Scottish borders. English Heritage define the term as "An uncrenellated, strong, fortified dwelling, of between two and four storeys. Occupied only in times of trouble built mainly in the border country of the North from the mid 14th to the 17th century.". However, the earlier, more general word has the sense of a wooden, defensive stockade or palisaded enclosure, often temporary in nature. It is derived from the latin word palus, meaning 'stake', which is also related to the English word 'pole' and 'pale' [hence "The Pale" in Ireland]. From the latin, the middle English word pel[e], that developed via the Old French word pel or piel, was another word for 'stockade' or 'stake' and simply referred to a palisade or fence of stakes. Indeed, Thomas Blount, in his Calendarium Catholicum, defined a peel or pele as "a Fort built for defence of any place, especially against the force of the Sea" [Calendarium Catholicum, or, An universall almanack 1664, by Thomas Blount. 1664] Thus the peel at Cowes was a timber stockade feature for defence of the small landing place at the mouth of the Newport River [Medina river]. Given the fact that East Cowes was more developed in that it had rudimentary landing facilities, it is at East Cowes that this peel has been located on the map above. During the Hundred Years War in the 14th century between England and France, much of the south coast of England was vulnerable to seaborne military raids by French forces, which in some cases were particularly destructive. Most coastal communities in the south of England suffered from these attacks and the Isle of Wight was no exception. The Abbot of Quarr, being one of the more wealthy and powerful landowners on the Island, was charged by the King, along with others, with the defence of the Island, such was the local nature of national defence in the medieval age. The Abbot at the time, a man known only as William, was also given permission by the King, Edward III, to protect Quarr Abbey and its possessions with fortified walls and other defences. The site of Fisshehous at the mouth of Wootton Creek. The Abbey was surrounded by a stone precinct wall, encompassing the main site. 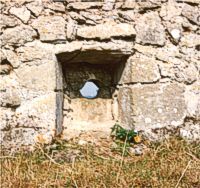 A number of rough gun-ports were also introduced into the masonry at a number of points to allow small calibre guns to cover the area to the north between the abbey site and the sea. The western extant embrasure is 24 inches wide and 28 inches high [The Enceinte Wall of Quarr Abbey, D.F. Renn.]. It is made up of four dressed slabs of Bembridge Limestone and is only 2 feet above the present ground level. 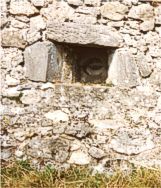 The outer side of the embrasure is made of two rough slabs, each with a semi-circular opening, which when placed together, form a circular gunport hole. "Fisshehous", on the right bank of Wootton Creek at Fishbourne Point, was also provided with defence works, possibly small fortifications of some sort, as the Abbot had "caused certain fortalices to be constructed at Fisshehous and at the abbot's mill". Wootton Mill was also fortified in a similar manner. 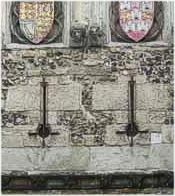 Licence for William, abbot of Quarr, in the Isle of Wight, and the convent of the same place, in the lifetime of the said William, to enclose with a wall and crenellate as many plots of land and of such precinct as they please on their own soil in the island, as well in the place called "Fisshehous" on the coast as elsewhere where it shall be expedient, and make castles or fortalices of these. Whereas the King lately granted licence for William, abbot, and the convent of Quarr in the Isle of Wight to enclose and crenellate divers plots of land on their own soil and castles or fortalices thereon in a place called Fisshehous on the sea coast and elsewhere on the island; he has now learned on the abbot's behalf that, whereas he has caused certain fortalices to be constructed at Fisshehous and at the abbot's mill and elsewhere on the island by virtue of the said licence, certain men of those parts are scheming to hinder those works and often set themselves to lay low and destroy the works begun by the abbot at his mill, the King has therefore taken the abbot, monks and fellow brethren, and the workmen and works of the abbey into his special protection, and has appointed Richard de Pembrugg and Theobald de Gorges, and deputies whom at the request of the abbot they shall appoint to survey the works, maintain and defend the abbot, monks and workmen and works, and arrest all contrariants during pleasure. [Above] The northern precinct wall of the Quarr Abbey complex looking east, showing the stone masonry elevation which stands approximately 10 to 12 feet. The gun loops are situated at the western end of this wall. [Below] Position of the gun loop at the west end of the wall near to the gateway. There is a second gun loop about 20 metres to the east of this one but it has been blocked up. [Left] Close-up of the gun loop, showing the rough nature of its construction. View of west gun loop from inside the enclosure wall. View of east gun loop from inside the enclosure wall. A selection of gun loopholes. Left: early gun loop at Cooling Castle (1381), similar to Quarr. Left middle: loophole in Southampton town wall, mid 14th century. Right middle: Winchester Westgate. Right: Carisbrooke Castle gatehouse tower. It is not known whether Wootton Mill and Fisshehous were each defended with a small fortification, such as a blockhouse, or peel , as at Shamlord [East Cowes] or whether they were fortified with a stone masonry wall, crenellated on the top and interspersed with artillery loops, as at Quarr Abbey. Of course, a ditch and palisaded rampart are also not out of the question, but the use of the word fortalice rather than wall does imply a small fort of some sort. Whether it has any bearing on these works is uncertain, but a defensive tower is known to have existed at the top of the hill flanking the west side of Wootton Creek, near to Wootton farm and church. 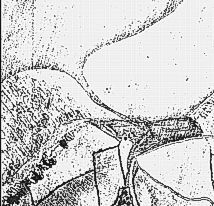 That traces of other fortifications (both archaeological and earthwork remains) from this period remain to be discovered is most probable as the abbott of Quarr was also instructed by the Crown to construct walls and ditches to protect vulnerable landing places on the Island. Commission to the abbott of Quarr, John de Insula, knight, Theobald de Gorges, Thomas Langeford and John Fitz Eustace, constable of the castle of Carresbrok in the Isle of Wight, ... to guard the siad island, array and try all defensible men thereof, ...and make proclamation that ... all places by the sea in the said island where ships can put in be made secure against incursions of the enemy and be fortified and strengthened with walls and dykes; and to arrest all contrariants and to commit them to prison until further order. By King and Council. As most of the potential landing places are the on the low-lying coastline of the north side of the Island, it is here that significant discoveries may be made. 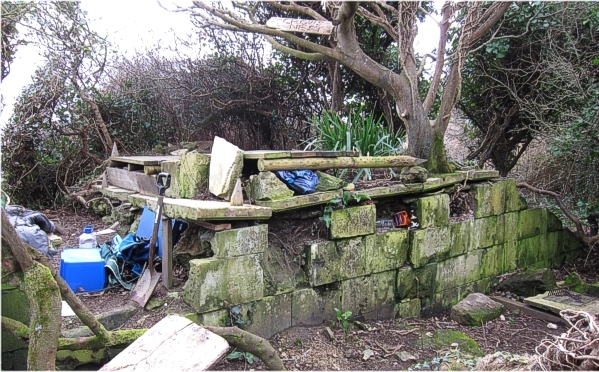 However, given the extent of coastal erosion at such places as Gurnard, Quarr, Hamstead and Elmsworth, it is also clear that any potential remains will have disappeared, forcing a reliance on documentary sources. The fort was mainly a wooden construction, the Manor accounts mostly mentioning expenditure for timber and carpenters. Its armament consisted of one gun that fired lead and stone shot. The bulwark seems to have had lines of hedging bushes planted in front of it as additional defence. Expenses for this fortification were met by the Lord of the Manor of Ashey, the Abbey of Wherwell, and thus it was a privately financed venture. This was a usual trait of small, local fortifications, whereas large forts were too expensive for private means, and thus required government intervention. Presentment that John Smith dug up the Plushes planted at Ryde for defence against foreign enemies - commanded to plant a new the same before the next court so as they become sufficient for the Bulwerke as in times past. A clue to the construction of Ryde fort can be sought in Sharpnode fort at the west of the Island. This latter was a square platform, 37 feet by 37 feet and 8 feet high on the seaward side. It was described as "a massy platforme only walled wyth planke and that begynneth to fayle wyth out anny dytche aboute yt" [1559 Royal Survey of the Isle of WIght : Staffs. Co. Record Office, D1778,III,01, f.8]. Plan of Sharpenode Fort from the 1559 Survey. The top of the picture faces towards the sea, while the angle bastions are directed towards the land. The walls were construsted from timber and intermediate ground filled with earth. 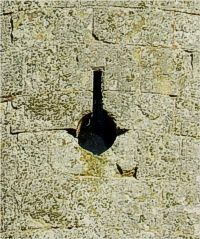 It is possible that Ryde Fort was similarly constructed as a square, timber and earth platform for a gun. Woorkes and Repacons done upon her Graces Castles and Forts within the Isle of Wight, viz. at Caresbrooke, Yarmouthe, Freshwater. ... makinge a skonce of earth and turfe at Sharpnode in Freshwater, fellinge of trees hewinge sawinge woorkinge and settinge of postes and rayles about the same at Sharpnode conteyninge 39 perches with other woorkes done there within the tyme of this accompte as hereafter more particulerly is mentioned, viz. From these accounts, it is clear that a square perimeter wall was constructed of posts with planks nailed horizontally with edges abutting. The interior was filled with earth with possibly a low rampart round the edge. A semi-circular version can be seen in the picture of Hull town defences below. 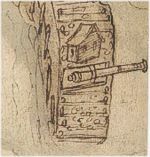 In the manor accounts for 1489-90, the use of the word "lying" when describing the gun could well suggest that the gun was mounted on a sledge-type mounting rather than on a wheeled carriage. This was a common arrangement in the early days of gunnery and was evident on ships such as the Mary Rose, and also on land where guns did not need to be moved a great deal, such as defensive positions round towns or in forts. It is clear that this fort was protected by a natural barrier in the form of a line or lines of plashed hedging. This served two purposes. Firstly, it acted as a form of sea defence to lessen the force of the sea, by catching beach material in the wattle-like branches of this fence. This allowed the beach to build up here and acted as a sort of groyne. This same function was a feature of Sharpnode Fort at the west of the Island where money was spent in 1587 on the "Settinge of pykes and hedges to kepe of the force of the sea from the skonce". Secondly these 'plushes' or plashes acted as a form of anti-personnel barrier - a sort of organic, early barbwire. 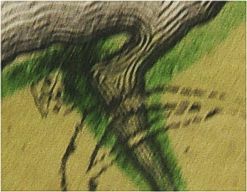 When hawthorn, blackthorn or firethorn were plashed in a hedge, they formed a difficult defensive hedge that acted as an obstacle to an attacking force. In the field, fortifications and troops used a dead version of this called abbattis, which were large branches of trees dug into the ground so that the splayed end branches formed a barrier to enemy troops. They were designed to slow down an advance enough to allow the defenders to have free shots as the attackers tried to clear the branch obstacles. "At Yarmouth against Hurst Castle; Garnard against Leap; Cowes against Calshoke; and Ryde against Portsmouth so as no daring approaching enemies can pass those channels without thundering gunshot from those commanding castles." "...the[y] landed in thre[e] severoll places all at one time pourposely to devid owr forces. Pierre Strosse landed at Bindbridge St Hellens where then wase a littell forte, and beate ower men being devided from ye forte into ye woods ..."
"... La descente se feit en trois divers lieux tout en un temps, pour tenir la force des ennemis separée : en un costé fut mandé le seigneur Pierre Strosse, pour descendre au dessus d'un petit fort ou les ennemis avoyent quelque artillerie, dont ils battoyent nos galleres par flanc : là dedans s'estoit retiré un nombre de gens de pied du païs, lesquels, ayans veu la hardiesse des nostres, abandonnerent le fort, et se meirent en fuitte dedans un bois taillis, vers les parties mediterranes : noz gens à la poursuitte en tuerent quelques uns, et bruslerent les maisons circonvoisines." The Nettlestone fort is clearly marked on a map [right] of c. 1570, commissioned by Lord Burghley. It is believed to have been made by John Rudd, a vicar who also became a skilled cartographer. The fort is circular in shape and seems to be made up of curved sections, suggesting the masonry of a small, round stone tower. This may be seen as a smaller version of round, stone artillery platforms such as the Round Tower at Portsmouth (a plan is shown in the inset picture for comparison) or Cromwell's Castle, Tresco. It may even be in the tradition of a locally built stone tower, such as Worsley's Tower at the west end of the Island. This tower was built by Sir James Worsley, while he was captain of the Isle of Wight between 1520 and 1538. It was described as 'round square [octagonal] and was 19 feet high and 26 feet in diameter. It has been suggested that "it was probably a single-storey structure, with provision for mounting the main armament on the roof, firing through embrasures in the parapet, with further gun-ports opening through the lower part of the walls near ground-level" [The History of the King's Works, vol.3, H.M. Colvin, gen. editor. HMSO, 1975]. This puts Worsley's Tower in same category of early Tudor gun-towers as Dover, Camber and Portsmouth. 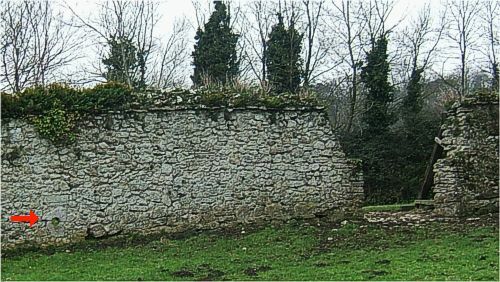 Given the easy local availability of stone, then the forts at Seaview, St. Helens and Bembridge may also belong to this same fort-building style. This fort was still in working existence in 1654, when it is mentioned in the accounts of Col. Hammond, that had been submitted and allowed by the Council in London on 21 August 1654. In a section on provisions for Yarmouth and Cowes Castles and Nettlestone Fort, it lists 39 shillings and 6 pence spent by Mr. Stephen Galpin for necessaries at Nettlestone Fort. [1654 Aug 17-31. SP 18/87] It is referred to again in government accounts in 1655, where it is described as Nettlesheigh Fort. Nettlestone Fort is again mentioned in accounts dated 12 July 1655, detailing the cost of garrison soldiers in England and Wales [SP 18/99] . In November 1658, Col. Sydenham, commander of the Island, received pay for various Island forts, one of which was that at Nettlestone [Official letters BL Add. Mss. 29319 op. cit.]. 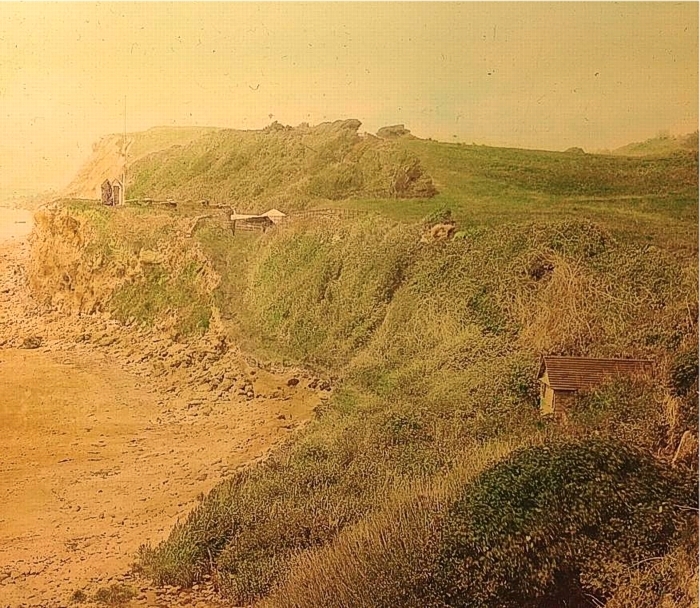 This seems to point to this bulwark being in the vicinity of Nodes Point, which had always been known as "Watch House Point" until the 19th century, because of the watch house that had been sited on top of the cliff at that point. Only later was the point renamed Nodes Point after the name of a field "Node Close". It may be significant that a Victorian battery was construsted here in the 19th century on top of the slumping cliffs at a very similar point to the Tudor fort of three hundred years before. Both this fort and the one at Seaview were sited to cover the anchorage at St. Helens, which was to become a favoured sheltered naval station in the 17th and 18th centuries. The forts also provided defence against any landings by enemy forces in the area. Although the area between Seaview Duver and St. Helens Duver consists of slumping cliffs, these are low in places and can be described more accurately as steep slopes covered with woods. 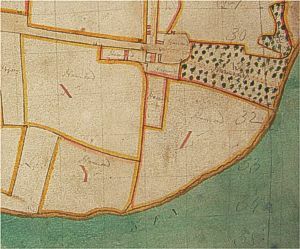 The last mention of the fort seems to be in a letter, dated 10 May 1660, from Lord Culpeper, Governor of the Island, to Sir William Oglander, Colonel of the East Medine militia, ordering him ensure that each Company performed two days labour on the fortifications at St. Helens and Bembridge [OG/19/78 or OG/BB/520]. 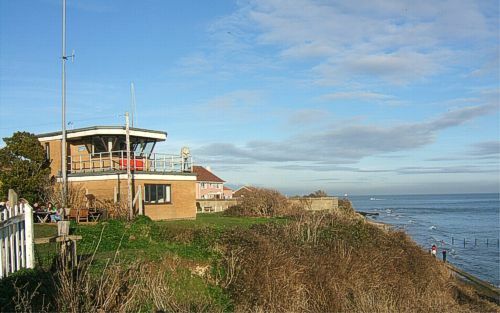 That there was a fort on 'Bembridge Isle' is evident from brief mentions in documents. It is first alluded to by Sir John Oglander in his Common place books while bemoaning the plight of the Island in having to put up with a military presence on the Island: "How willing were we to have soldiers brought in to us, and to have new forts built at Bembridge, Cowes, Nettlestone etc., till now our Island being all made a Garrison, we now too late repent us, as being made slaves to our slaves." This fort is further mentioned in government accounts, where it is referred to as "Brinn Bridge" fort. It is also mentioned in other government accounts, already mentioned, where it is listed as Bembridge Fort [SP 18/99 Accounts 12 July 1655; Official letters BL Add. Mss. 29319 op. cit.] The last mention of Bembridge fort arises in the letter already mentioned above between Lord Culpeper and Sir William Oglander in 1666 [OG/19/78 or OG/BB/520]. Like the forts at Nettlestone and St. Helens, this fort was abandoned in the late 17th or early 18th century. A memory of it remained in the field name "Fort Ground" that lingered on until the early 19th century. The site of Fort Ground as it is today looking north-east towards Forelands. In the Cowdry engraving entitled "The Encampment of the English Forces near Portsmouth", a gun battery is visible at Yarbridge covering the causeway that gives access to the Bembridge peninsula. Armed men are shown with two guns behind two ramparts that are arranged to form a wide salient angle. Towards Sandown, at Morton, there is a timber peel or circular wooden stockade, again containing armed militia. There is no reason to doubt the truth of these two features as other fortifications have been included accurately in the engraving. Today there is a conspicuous flat topped ridge of hard Upper Greensand stone to the south of the The Mall where it descends to the crossroads traffic lights at Yarbridge. This can be explained as a natural feature, where the road has caused erosion on the north side to form a small gorge. However, it would also give a vantage point for a gun battery allowing a certain amount of elevation over the causeway. 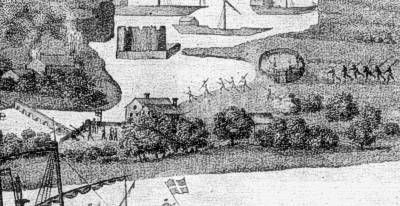 [Left] Detail from the Cowdry engraving showing Yarbridge and Sandown area in 1545. [Below] Enlarged detail of timber stockade. Enlarged detail of gun platform. [Left] Map of c. 1570 showing square feature in the middle of Yarbridge causeway[BL Royal MS. 18. D.III, f.18]. Inset shows an enlarged detail of structure. Its function is unknown but possibly serves a defensive purpose. Although this is not a pre-1700 fort, it has been included as it is an example of a minor fort built privately by a local landowner. 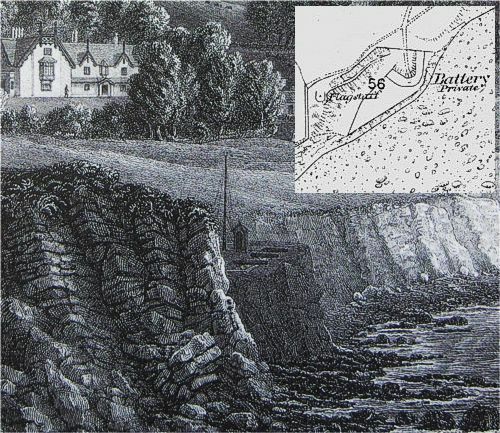 In the late 1790's, as the international situation between Britain and Revolutionary France became increasingly tense, Sir Richard Worsley of Appuldercombe decided to construct a small battery on the cliff top overlooking Mount Bay. Written in 1847, the recollections of John Green, a local St. Laurence inhabitant, shed some light on this fort. These were printed in the Isle of Wight Mercury in 1890, and special thanks are due to Dr. Alan Champion for making this and other excellent primary sources available on his website. The fort erected on the lawn at St. Lawrence by the late Right Honourable Sir Richard Worsley, of Appuldurcombe Park, ( who died August 8th. 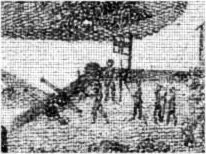 1805 ), and mounted six six cannon guns, a present by his late Majesty, King George the 3rd. The guns were Bell metal, cast from bells of churches in France in the time of war, and taken by some of gallant heroes and brought to England as a prize. At the finish of the fort, there was great rejoicing amongst the people, and in exercising the guns an accident happened, and a man`s thumb was blown off by neglect in stopping the vent. The fort has been improved by the late Honourable Earl of Yarborough; but `tis not the same guns as were there at first. 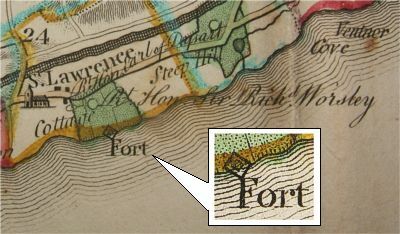 Detail of St. Laurence area, showing the fort set up by Worsley. In the early 19th century, a number of guide books mention this fort, which was built on the land of the new cottage, Marine Villa, that Sir Richard Worsley had built to the east of St. Laurence. John Albin, writing in 1818, described the origin of the canons mounted in the battery: "Here among other whimsicalities, is a fort on which are mounted guns cast out of the church bells at Nantes during the French Revolution, which guns were taken from a French privateer, captured a little way off, opposite the spot where they are now placed" [A Companion to the Isle of Wight, John ALbin. Newport, 1818]. In 1806, John Bullar wrote: "Since the present war, the late owner erected a battery, with several pieces of cannon, commanding the adjoining coast." [An Historical and Picturesque Guide to the Isle of Wight, John Bullar. Southampton, 1806]. In 1812, William Cooke wrote two pages describing this cottage: "In the deep recess of the village of St. Lawrence, between the road and a pleasant sandy cove, bounded by white cliffs, and defended by a small battery of brass cannon, on a verdant lawn, embowered in delightful shades, stands this lovely Marine Villa"[A New Picture of the Isle of Wight by William Cooke. Southampton, 1812]. 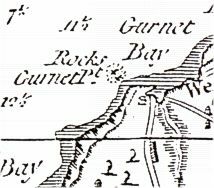 In Brannon's 1848 edition of Vectis Scenery, he writes: "On the sea-cliffs are two small forts mounting several guns and carronades : and at a short distance is a long, slated building, occupied by the men (and their families) be- longing to the preventive service.". The battery is situated on a wide ledge on the side of a cliff and commands the shingle beach of Mounts Bay. 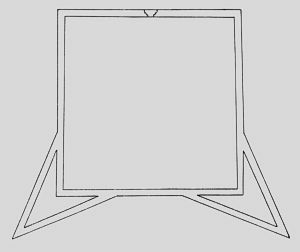 It is built in the form of a raised platform. The walls are constructed using stone ashlar blocks, with thin paving stones (106cm x 46cm) with a bevelled edge forming the top of the platform. The wall on the sea side of the battery was constructed from rough blocks of random rubble stone. 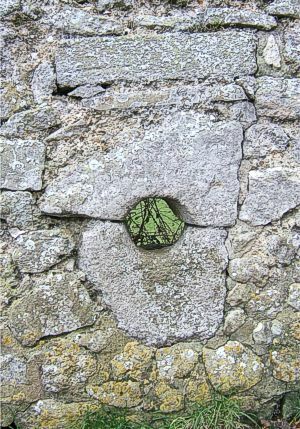 A mixture of soil and small broken rocks was used as packing infill between the walls. Inset map shows the battery in 1862. Above: The remains of the battery in 2015.